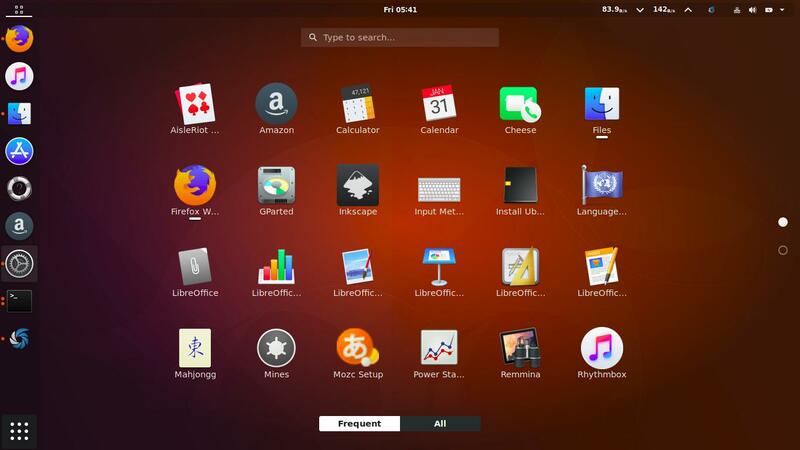 This article explains desktop themes installation step-by-step for Ubuntu 17.10. 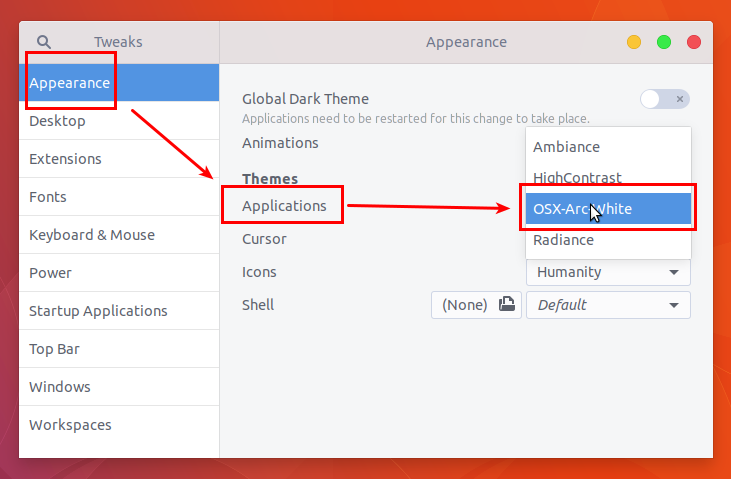 First, you need to distinguish between 3 types of theme: GTK Theme, GNOME Shell Theme, and Icon Theme. 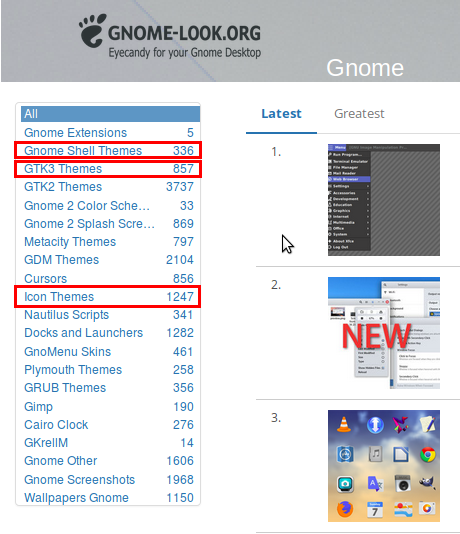 Second, you need to know where to download themes: GNOME-Look.org. And third, know the steps to install those themes. The examples used here are OSX Arc White, Flat Remix, and macOS iCOns respectively. 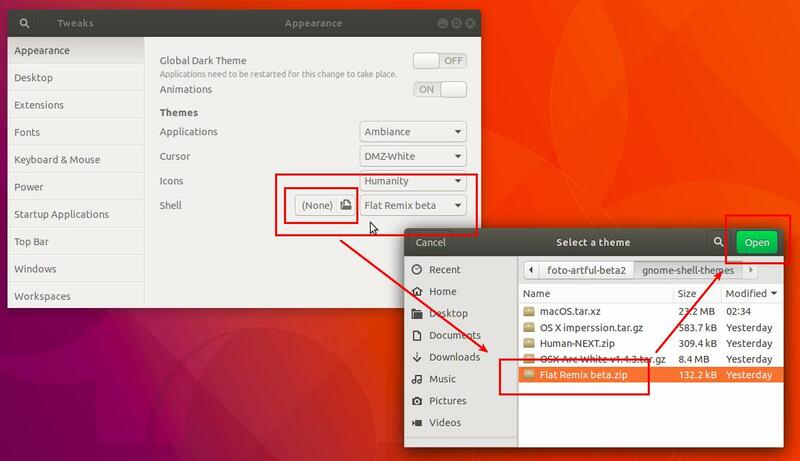 For those purpose, you will need GNOME Tweaks program on Ubuntu as it eases you to install themes. Enjoy! To distinguish 3 types of theme you need to keep these in mind. GTK Theme: the specific theme for buttons/scrollbar ("toolkit") of the desktop. This including window border and control-buttons colors. Ubuntu 17.10 uses GTK3 Theme, so you don't need GTK2 Theme. 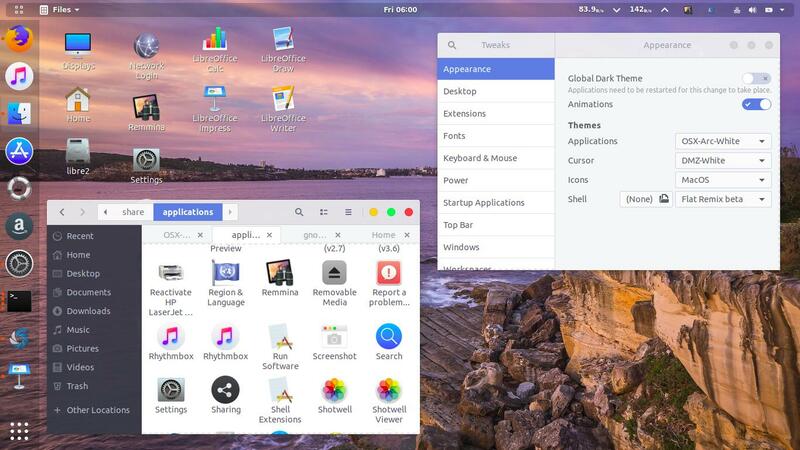 GNOME Shell Theme: the specific theme for global appearance of the desktop (such as the panel, menu and switcher appearances) minus toolkit. Icon Theme: the specific theme for icons of the desktop. This changes all applications' logos. You may find many GTK themes, many GNOME Shell themes, and many Icon themes. Some of themes are bundled (one file with 3 types of theme), some others are not. You may install a certain GTK theme, and not install the others. 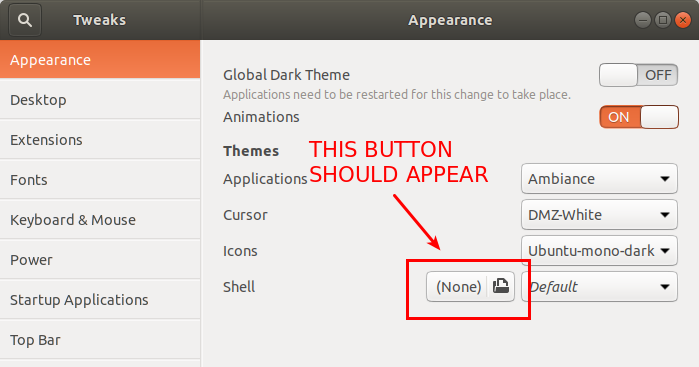 You may install a certain GTK theme, plus a certain GNOME Shell theme, plus a certain Icon theme. 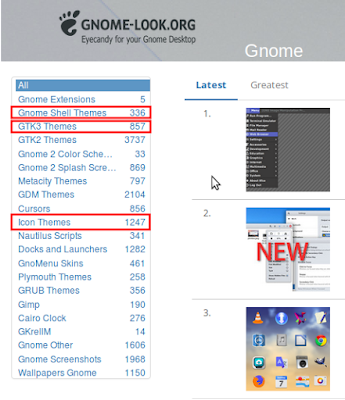 You may change any theme at any time with the GNOME Tweaks. Here, I will explain with 3 examples how to install GTK3 Theme: OSX Arc White, GNOME Shell Theme: Flat Remix, and Icon Theme: macOS iCons. 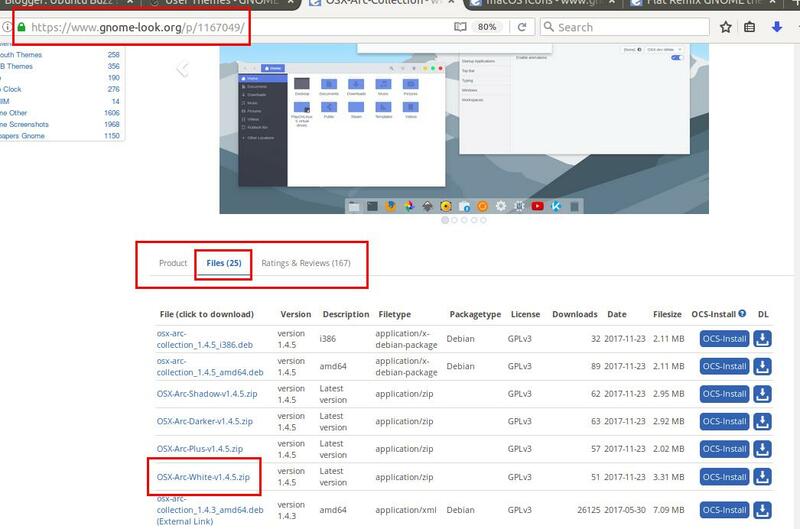 All of them are available at GNOME-Look.org. Note: what about GDM Theme? Here I purposely don't mention it, but, GDM theme is the theme for login page look. 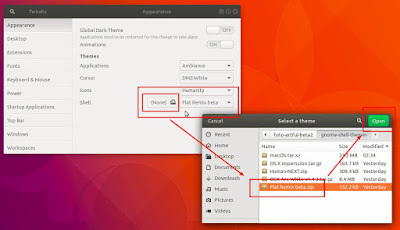 You need to prepare the GNOME Tweaks so you will be able to install GNOME Shell Theme by click. 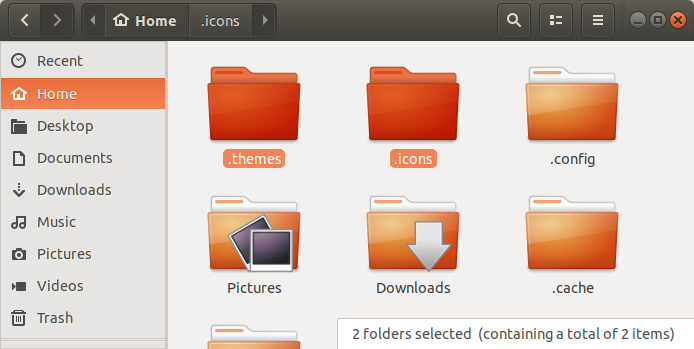 You also need to create 2 new folders .themes and .icons at your $HOME folder. 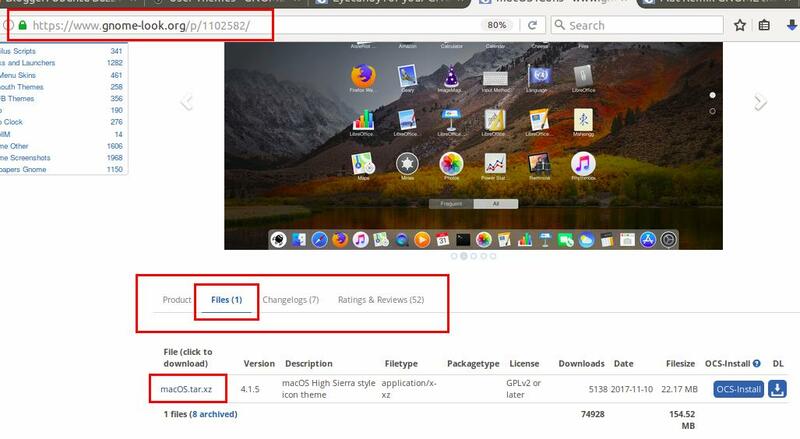 Install the extension: visit the User Theme Extension page with Firefox and install it. If the extension failed to install, follow Extension Installation Guide. Now the Tweaks is ready. Press Ctrl+H to show hidden files. You should see dotted folders (.config, .cache, .mozilla, etc.) there. Create new folder named .icons . Create new folder named .themes . Press Ctrl+H again to hide them. See the 'Files (25)' tab at middle of page. See the OSX-Arc-White-v1.4.5.zip file among many files there. Press Ctrl+H to show hidden folders. Open the .theme folder at $HOME. Copy the GTK3 theme file 'OSX-Arc-White-v1.4.5.zip' into .theme folder. Double-click the file > you see 'OSX Arc White' folder inside > choose the folder > press Extract > press Extract again. IMPORTANT: now in the .theme folder, you should have 'OSX-Arc-White' folder where you should see 'gtk-3.0' folder inside it. See Theme > Applications section. Change the theme to OSX Arc White. 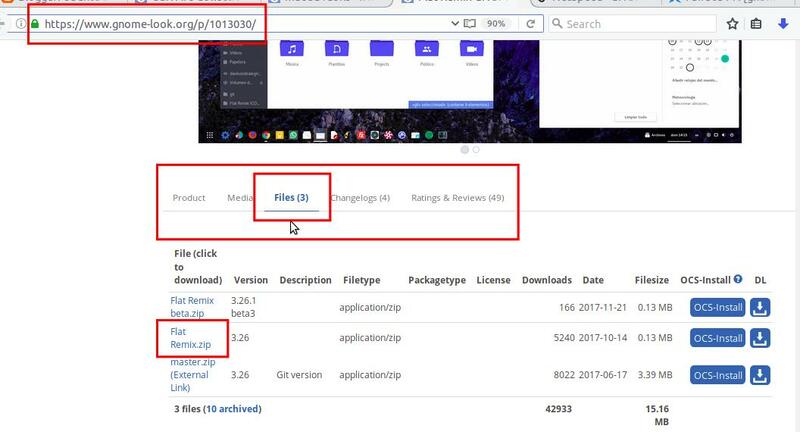 See the 'Files (3)' tab at the middle of page. Download the 'Flat Remix.zip' file. See Theme > Shell section. Click the folder button > navigate to Flat Remix.zip file > Open. Change the theme to 'Flat Remix'. See 'File (1)' tab at middle of page. Open .icons folder at your $HOME. Copy macOS.tar.xz file to .icons folder. Right-click the file > Extract Here. You get macOS folder inside the .icons folder. See Themes > Icons section. Change the icon to 'macOS'. Combining themes type 1, 2, and 3 resulting in a new appearance to your Ubuntu 17.10 desktop. Congratulation!